120518: Friday=Campbell Hall, Saturday=Fairfax Fair & Gnoss Air Field . . .
Looks like the cold and rain is upon us again. Hope you’re all keeping warm and dry out there, “Winter Is Coming” as they say in The Game of . . .
We’ll be at Campbell Hall this Friday at our usual time of 6:30p to 9:00p. BYPL (Bring Your Pot Luck – maybe Comfort Food? ), BYOGear (Music stands and Book Lights) and BYMahalo and Aloha for Reverend Chip and his congregation for opening up their beautiful venue to us once again. Last Friday was our “Winter Ball Night” at the Elks. 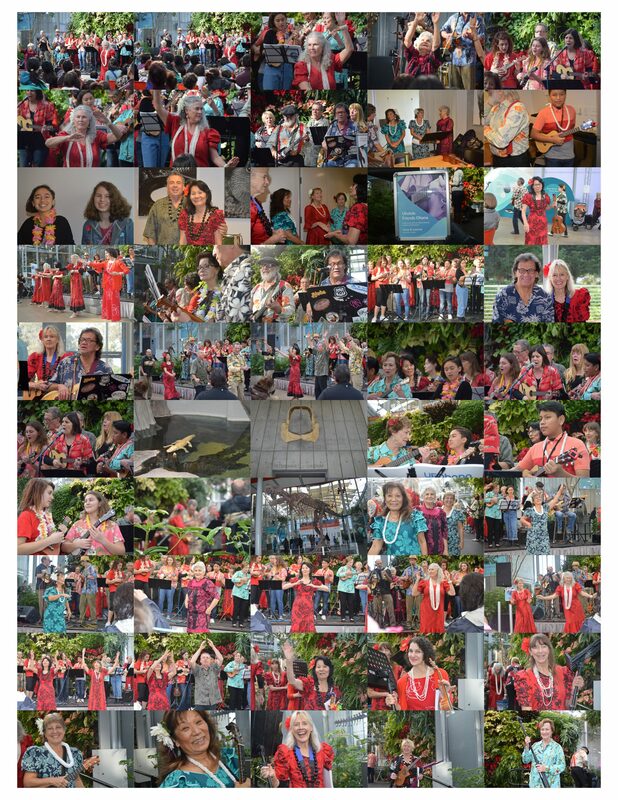 Mahalo to all that took the effort to dress up and share their finery with us. There were some fabulous looking Prom Queens out there! Click below and see for yourself. Mahalo to all of you who participated in the spirit of that special night. Last Saturday was the Great SMART Train Mea pāʻani na Keiki (Toys for Tots) Kanikapila. Mahalo Nui Loa to all that braved the cold weather, assisted with setup, then performed for 2 hours, then helped with tear down, along with donating Toys and for generally just “keeping each other company.” Though the audience was sparse, there was no lack of UFOhana spirit at the event! As Marion said, “We sure know how to keep each other entertained.” Click below for online album. Yes, it’s that time of the year and we’ve been invited once again to play at the Fairfax Christmas Craft Fair. Mahalo to Jack Irving and the Fairfaxian Elders for keeping us in mind. We’ll be back on the main stage in the Pavillion, click here for directions. We’re scheduled to play 11:30a to 12:30p. We’ve only got an hour so be there no later than 11:00! BYOGear (Music Stands), BYOChristmas Books from last year (if you still have them), I’ll bring some just in case. We have limited stage space so please buddy up on music stands. Dress Hawaiian Christmas Festive (Bright Happy Colors / Christmas Bling) if you can. I’ll need help with setup and tear down if anyone’s available, I should be there by 10:30. Mahalo and kala mai iaʻu (I’m sorry) for the short notice. After the Fair, Saturday evening, we’ll be playing at the Gnoss Field Community Association’s Holiday Party. We play 6pm – 8:30pm See below for details, click the image below to access their website. BYOGear, BYOGigBook, and the Christmas Manual from Fairfax. Also, if you’re up to it, some of us are dressing “Aeronautical”. I understand we may even have Amelia Earhart, late era Fighter Pilots (Goose, Iceman, Maverick?) and First Class Flight Attendants make an appearance! Please bring a Potluck to share with the GFCA Ohana if you’ll be having dinner with us. As Binford Road brings you to the main airport parking lot turn right and go about 500 feet to the building with the flagpole (county administration building)-the big hangar that’s attached to that building is where the event will be. Btw, if anyone out there needs Christmas Aloha attire. Nohea does have a few Christmas Vintage Aloha shirts available. The newest addition, below, is a vintage special edition, size XXL, Tommy Bahama from 2006. Available for $50, text her 415-572-1175 if you’re interested. Ok, I’m just about pooped from thinking about what’s coming up . . . I need to start recharging my internal Kanikapila Battery. Hope to you all this Friday and weekend! Stay dry and warm . . .
Yeah, Yeah! Merry Ho! Ho! Next PostNext 121018: Red, Green & Bling Ball at the Elks this Friday!